ICE-16D is a balanced I/O version of the popular ICE-16 multitrack recorder / interface. ICE-16D offers fully balanced inputs & outputs on standard D Sub connectors, making it ideal for use in professional studios or where long cable runs are needed. ICE-16D records 16 tracks of audio directly to a USB key or hard drive. Just connect the 16 analogue inputs to any line level source (your mixer’s direct outs are ideal), plug in your memory and press record to capture live shows, band rehearsals, conferences or services for mixing or playback afterwards. ICE-16D also functions as a 16 x 16 channel interface to your computer in the studio, streaming high quality digital audio at 24bit, up to 96kHz sample rate over FireWire or high speed USB 2.0. Units can be linked to expand the channel count even further. 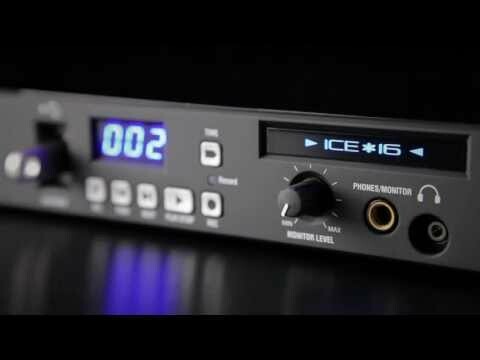 Live or in the studio, ICE-16D makes multitrack recording easy. Multiple units can be daisy-chained over the FireWire bus, or kept in sync using the DIN connectors when recording on multiple USB devices, making ICE-16D the perfect companion for both small and large analogue consoles such as our acclaimed ZED, MixWizard and GL mixers. Plug into your desk Direct Outs or use a mix of Groups and Aux sends to save on channels. The USB DRIVE is automatically detected and checked by the system. Starting the recording is as simple as pushing a button. Remove and plug the key into a computer to access or transfer the WAV files to any DAW. Removing the USB stick or powering up the unit without one enables the USB / FireWire interface. Signals present at the inputs will be sent to the Mac or PC on channels 1-16. WDM/ASIOTM drivers and USB2.0 class compliance ensure full compatibility with most DAWs, including Logic, Sonar, Cubase and Pro Tools. Fancy a ‘virtual soundcheck’ or just need to play cues during a live gig? Tracks can be played back directly from the USB drive and full multichannel audio can be sent from the computer to the ICE-16D analogue Outputs. ICE-16D is Core Audio compliant so there are no drivers required for Mac computers. Simply connect your ICE-16D to your Mac and follow the instructions in the User Guide.